This page is dedicated to the mbira and my experiences playing it. 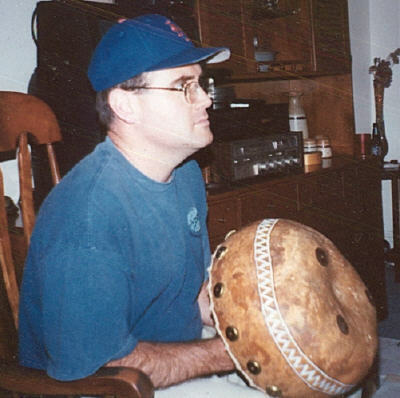 I have been playing mbira for since 1996. The more I learn about mbira, the more I realize that I have a long way to go. It is a bottomless sea of music, and mbira people are the best musicians to hang out with! The Mbira DzaVadzimu ("Mbira of the Ancestral Spirits") is one of several mbira instruments played by the Shona People of Zimbabwe, in southern Africa. Sometimes people refer to this family of instruments as "Kalimbas", "Karimbas", or "Thumb Pianos". The Shona word for these instruments is "Mbira", and because I play Shona mbira, that's the term I use. I have often seen the terms "Kalimba" and "Karimba" usually used to refer to the smaller instruments, with 5 to 15 keys. 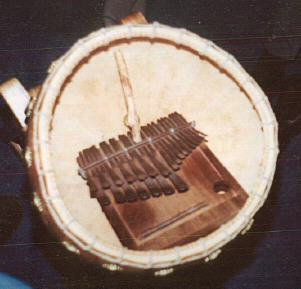 The Mbira DzaVadzimu has 22 to 24 keys and is played with the two thumbs, and the right index finger. Sometimes the mbira is put inside a big gourd, called a "deze" which amplifies the sound considerably. The mbira is often used for sacred spirit ceremonies, but can also be played for the enjoyment of the music itself. There are a good number of players in the USA, with the highest concentration in the Pacific Northwest. I have been fortunate to learn a lot from Americans Gary Zablackis and Erica Azim, and I also took a few lessons from Shona musiciains Forward Kwenda, Tute Chigamba, and Wiri Chigonga. My main mbira is in the high Nyamaropa tuning, and was made by Fraderick Mujuru. Earlier this year I was lucky enough to pick up both a Gandanga, and a Dambotsoko tuned mbira which was also made by Fraderick Mujuru. He is a truly great mbira maker and musician, and his meticulous craftsmanship is evident in his instruments, and recordings I have heard of him playing. The Mbira Page is a web page under construction that has some good background information. Mbira.org - Erica's site with info about mbira lessons and field recordings. Dandemutande, a web page full of info about Zimbabwean music, with many links. You can purchase recordings of music from Zimbabwe from this site. One of my favorite new CD's of traditional Mbira was just recorded by Forward Kwenda, with Erica Azim on a lot of the tracks. It is called "Sviriko" and is on the Shanachie label #64095. For traditional mbira music, I think this is the best CD which is readily available in this country. Available through Dandemutande (see above), or in most better record stores. Thomas Mapfumo and the Blacks Unlimited are an electric band from Zimbabwe that has been playing electrified mbira music since the seventies. This style of music is known as "Chimurenga". Several of their albums have been released in the states by a company called "Zim Bob". These records are available through Dandemutande (see above). As a starting point, I would recommend "Vanhu Vatema" (from 1993) and "The Singles Collection" (a nice retrospective of older material). Mapfumo has a new CD out on Peter Gabriel's Real World records, which is quite good, and was the last record that guitarist Jonah Sithole played on before his death in 1997. This CD "Chimurenga, Sacred Spirit Music of Zimbabwe" is available in most larger record stores. The Soul Of Mbira by Paul Berliner, 1978, revised 1992. This book is very well written and explains the whole culture of Mbira music. It is available in softcover for a reasonable price through Dandemutande (see above).